Traditional braces are made from brackets affixed to your teeth. Wires are threaded through slots located in these brackets. Metal bands encircle the back teeth for some patients. “O-rings” or “ligatures” are tiny rubber bands that hold the wires to the brackets. Most brackets are made of stainless steel, while the wires are made from a metal alloy. The wires help to deliver a gentle, but constant for that move your teeth. An orthodontic specialist can help you decide which treatment option is best for your needs. Traditional ceramic braces appear to be almost invisible since they are the same color as your teeth. These braces are affixed to the tooth. The wires are threaded through the bracket’s slots. “O-rings” or “ligatures” are tiny rubber bands that hold the wires to the brackets. These brackets are porcelain or ceramic, while the wires are a metal alloy. The wires help to delivery a gentle force that assists in moving your teeth. Visit an orthodontic specialist to learn about treatment options that can fit your needs. These braces are almost invisible because they are tooth-colored. The self-ligated ceramic braces are affixed to your teeth. Wires are threaded through bracket slots. There are built-in clips that attach the wires to the brackets. The brackets are made from porcelain or ceramic materials. The wires are metal alloy and can deliver gentle and constant pressure that help to move teeth. See an orthodontic specialist for an option that works best for your specific needs. Self-ligating metal braces are made of brackets affixed to your teeth. Wires are threaded through the bracket’s slots. For some patients, metal bands encircle the back teeth. There are built-in clips that hold the brace’s wires in place. 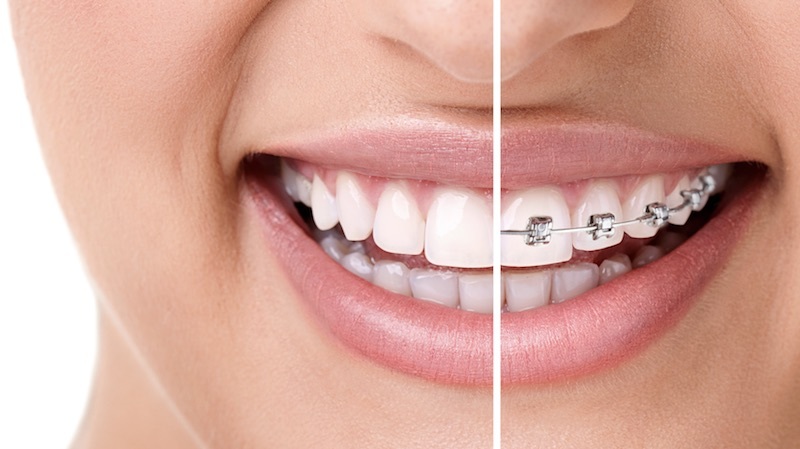 These braces generally have stainless steel brackets and metal alloy wires. These braces offer a gentle, constant pressure to move your teeth. Visit your orthodontist for treatment options that fit your specific needs. 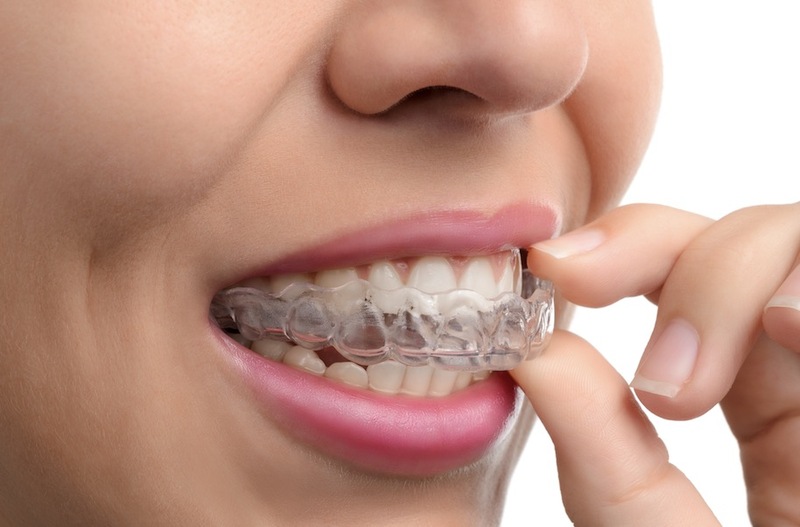 Clear aligners are thin, clear, plastic-like trays. These trays are designed to fit your teeth. A patient is responsible for using and removing the aligners. Most people need a series of aligners to properly move their teeth. You would need to wear each aligner for two to three weeks. The teeth are moved less than a millimeter at a time. Aligners must be removed when brushing, flossing and eating. The number of aligners needed to correct a misalignment varies based on each person’s orthodontic needs and its correction. See an orthodontic specialist who can help you determine the treatment option that would work best for your needs. Archwires fit into bracket slots and move the teeth. Ask your orthodontic specialist about the treatment options that would work best for your specific needs. When you look at a cross-section, the shape of the round archwire is round. This wire is used in the early stages of an orthodontic treatment. It is used to align and level the teeth. This wire fits in the bracket slots and moves the teeth. Visit an orthodontic specialist for a treatment option that fits your needs. When you look at a cross-section of this wire, the share of the rectangular archwire is rectangular with a square on both ends of the wire and a long segment in the middle. Rectangular archwires are used in the later stages of treatment to refine and control the movement of the teeth. This wire fits in the bracket slots and moves the teeth. An orthodontic specialist can help you determine the best treatment option for your specific needs. Elastics apply some extra force to your teeth. These rubber bands work in a way that braces cannot. They can move teeth into the ideal position. Tiny hooks are attached to lower and upper brackets and are the attachment points. The elastics configuration can be diagonal or vertical. The placement depends on the patient’s needs. The patient is responsible for using and removing the elastics. An orthodontist can determine how the elastics should be worn. Only wear elastics as they are prescribed. If you do otherwise, you can place too much force on your teeth which can cause harm. Visit your orthodontist for options that fit your personal needs. Retainers are removable, slightly flexible, thin, clear and made of a plastic-like material. A retainer is the exact placement and size of your teeth. There are removable and fixed retainers. Both will hold your teeth in a new position after you’ve completed an “active” orthodontic treatment plan. A retainer allows the newly formed bone to harden. If you wear a retainer as instructed, it will be the key to maintaining your orthodontic treatment’s benefits. After the “active” treatment is over, a patient needs to wear their retainer full-time for at least six months. Afterward, it is recommended that they wear the retainer at night-time. When not being worn, a removable retainer should be stored in a case which will be provided by the orthodontist.